It all began with Bretta - a Peruvian import which I chose from a large group of females imported by Bozedown whilst in quaranteen in Switzerland back in 2004. Unknown sire and dam - they don't keep records in Peru. 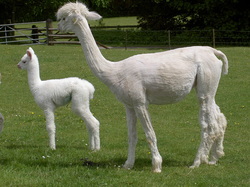 She didn't understand what was happening when she gave birth to her first born Bonita, and tried to attack her cria as she was being born, thankfully I was there just in time! A wonderful mother, after those first few minutes, and ever since. Bretta has had 8 crias so far, and we have had many Champions from her line including a Supreme Champion in her daughter Bonita. Dam: Bretta x Sire Trojan of Bozedown another Peruvian import. 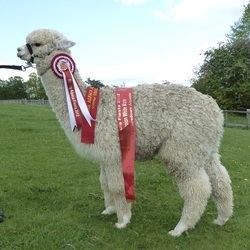 She was a stunning cria and very successful in shows as a Junior, winning Junior white female in a huge class of 30 and then going on to win Champion White Female. She won us our first Supreme Champion in 2008. Fiercely protective of her crias - a bit of a screamer and a very accurate spitter when protecting her young, otherwise angelic! Bonita has had 5 cria so far, 2 of them becoming Champions - she currently has a solid dark fawn male cria at foot by Snowmass Golden Legend - we have called him Baratheon. Bon Bon is quite a character, friendly and easy going. 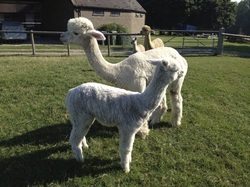 A great mother, always loads of milk and looks after her cria really well. If we walk through her field with an entire male she will charge at him and barge him out the way if she's pregnant, or drop like a stone for him if she's not - so no need to do a spit off! Sometimes she will 'ride' the other females - regardless of whether she's pregnant or not. A very easy girl to handle and halter trained. Her mum's milk wasn't great to start with so we supplimented her with a bottle for a week or so. 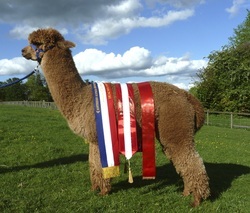 She was shown as a Junior and placed both in fleece and halter shows. 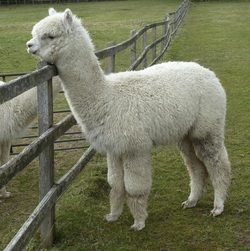 Part of our great "B" line, she has had 3 stunning cria so far, all of them Champions. Bonaventure here with her first cria Bossy Boots. She's a wonderful mum and very proud of her cria. She was shown successfully as a Junior and an intermediate winning at 3 shows and gaining a Reserve Champion and a full Champion in very competitive classes. Her daughter Bossy Boots was shown at the 2014 BAS National Show and was placed 2nd in the Junior White Female class. We sent this female to our associates in Belgium and now her new owners have a great opportunity to breed with these genetics. Dam: Bon Bon x Sire: Tulaco Centurion DF who we owned at the time. For Sale as we have too many females related to him. 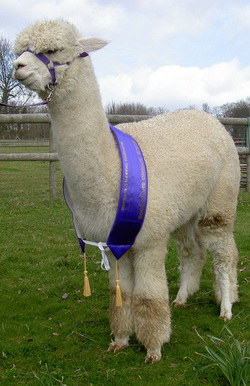 Consistently placed every time he has been shown, this boy has a superb gentle temperament and a stunning fleece. Baylee will be standing in Belgium for stud services for 2015 with our associates Alpaca Tumulus. 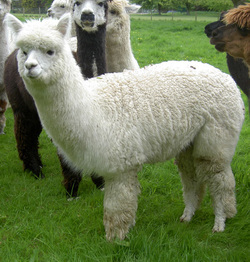 For Sale in Belgium with Alpaca Tumulus. There are many more in this "B" family ... and a lot more to come. Many are for sale, so should you wish to introduce some of these genetics into your herd then please give us a call.